[S1198] The Rockingham Register, Harrisonburg, Va., 15 Aug 1905, p. 3, col. 7 (obituary of Mrs. Catherine Bushong, quoted in electronic mail from Gloria Bushong to e-mail address, 3 Sep 2009, naming Mrs. Catherine Bushong as her mother). [S1198] The Rockingham Register, Harrisonburg, Va., 15 Aug 1905, p. 3, col. 7 (obituary of Mrs. Catherine Bushong, quoted in electronic mail from Gloria Bushong to e-mail address, 3 Sep 2009). [S1198] The Rockingham Register, Harrisonburg, Va., 15 Aug 1905, p. 3, col. 7 (obituary of Mrs. Catherine Bushong, quoted in electronic mail from Gloria Bushong to e-mail address, 3 Sep 2009, naming Mrs. Catherine Bushong as his mother). Birth*: He was born on 7 August 1886. Death*: He died on 7 February 1952 at age 65. Burial*: Interment was in Oakwood Cemetery, Pulaski, Pulaski County, Virginia. [S1197] Gloria Bushong, electronic mail to e-mail address, 3 Sep 2009. [S1197] Gloria Bushong, electronic mail to e-mail address, 3 Sep 2009, (stating that he moved there shortly after his mother's death, which occurred on 11 Aug 1905). [S1197] Gloria Bushong, electronic mail to e-mail address, 3 Sep 2009, (naming Archibald Abraham Miller Bushong as her father). Birth*: She was born on 25 March 1880. Death*: She died on 25 February 1952 at age 71. [S1197] Gloria Bushong, electronic mail to e-mail address, 3 Sep 2009, (naming Emily Louise Allison as her mother). Birth*: She was born on 29 November 1915. Death*: She died on 9 August 2001 at age 85. [S961] Find A Grave, online at http://www.findagrave.com, memorial for (Emma Bishop Berry, memorial no. 5719579). [S961] Find A Grave, online, above, memorial for (Hiram D. Berry, memorial no. 5719580). [S1199] Hiett's LyBrand Funeral Home, Wills Point, Tex., online http://www.hlfhs.com/obituary.aspx, ca. 27 Dec 2009, viewed 31 Dec 2009 (obituary of Florence Bartlett DeRuvo) (naming Florence Bartlett as his mother). [S1199] Hiett's LyBrand Funeral Home, Wills Point, Tex., online http://www.hlfhs.com/obituary.aspx, ca. 27 Dec 2009, viewed 31 Dec 2009 (obituary of Florence Bartlett DeRuvo) (naming Florence Bartlett as her mother). [S1201] Records of Bank Sutherland Funeral Home (later McCammon Funeral Home), Corsicana, Texas, online at http://www.txgenweb6.org/txnavarro, (record for J. W. Nobles) (naming William Nobles as his father). [S1201] Records of Bank Sutherland Funeral Home, online, above, (record for J. W. Nobles) (naming Eliza Owens as his mother). [S1201] Records of Bank Sutherland Funeral Home, online, above, (record for J. W. Nobles) (stating that he was fifty-one years old when he died on 3 Jun 1917). [S1201] Records of Bank Sutherland Funeral Home, online, above, (record for J. W. Nobles). [S1200] A Memorial and Biographical History of Navarro, Henderson, Anderson, Limestone, Freestone and Leon Counties, Texas (Chicago, Ill.: Lewis Pub. Co., 1893), p. 762 (naming Nelson Owen as this child's father). [S1223] Frank W. Johnson, A History of Texas and Texans, ed. Eugene C. Barker and Ernest William Winkler (Chicago, Ill.: The American Historical Society, 1914), vol. IV, p. 1727-28, s.v. "John Burrow Haynie," available online at http://www.rabgenealogy.com/ui71.htm (not giving the date but stating that he was "past fifty years of age" when he died about 1856). [S1200] A Memorial and Biographical History of Navarro, Henderson, Anderson, Limestone, Freestone and Leon Counties, Texas (Chicago, Ill.: Lewis Pub. Co., 1893), p. 533. [S1223] Frank W. Johnson, A History of Texas and Texans, s.v. "John Burrow Haynie," above. [S1200] A Memorial and Biographical History of Navarro . . . and Leon Counties, Texas, above, p. 533 (naming George Haynie as her father). [S1200] A Memorial and Biographical History of Navarro . . . and Leon Counties, Texas, above, p. 533 (naming George Haynie as his father). [S1223] Frank W. Johnson, A History of Texas and Texans, s.v. "John Burrow Haynie," above (naming George W. Haynie as his father). [S1223] Frank W. Johnson, A History of Texas and Texans, ed. Eugene C. Barker and Ernest William Winkler (Chicago, Ill.: The American Historical Society, 1914), vol. IV, p. 1727-28, s.v. "John Burrow Haynie," available online at http://www.rabgenealogy.com/ui71.htm (stating that she died at Eureka, Texas "when past sixty years of age"). [S1200] A Memorial and Biographical History of Navarro . . . and Leon Counties, Texas, above, p. 533 (spelling her surname as Linn and stating she was a native of Tennessee). [S1223] Frank W. Johnson, A History of Texas and Texans, s.v. "John Burrow Haynie," above (stating that she was past sixty years of age at death). [S1200] A Memorial and Biographical History of Navarro . . . and Leon Counties, Texas, above, p. 533 (naming Sidney Linn as her mother). [S1200] A Memorial and Biographical History of Navarro, Henderson, Anderson, Limestone, Freestone and Leon Counties, Texas (Chicago, Ill.: Lewis Pub. Co., 1893), p. 533 (naming George Haynie as her father). [S1200] A Memorial and Biographical History of Navarro . . . and Leon Counties, Texas, above, p. 533. 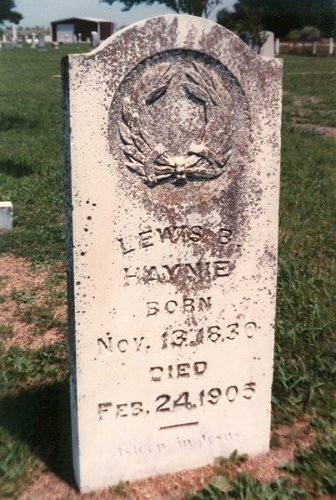 Lewis B. Haynie's tombstone, Rice Cemetery, Rice, Tex. Note*: • He was a merchant, farmer, and land man. 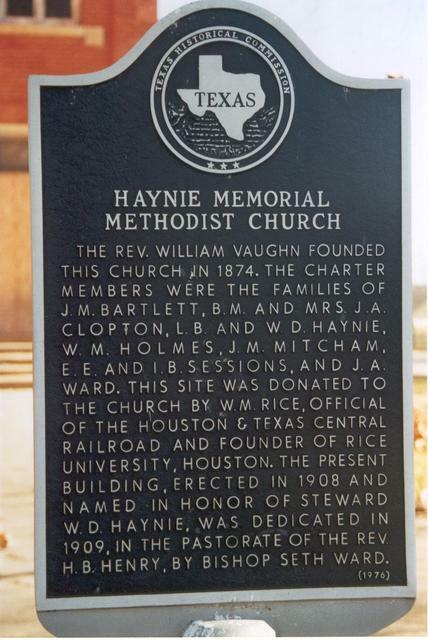 • A picture and transcript of a historical marker at the site in Rice, Tex. of Haynie Memorial Methodist Church, of which he was a charter member in 1874 but which is no longer operating as a church, is here. [S189] Navarro County Cemetery Records, vol. 9 (Corsicana, Tex. : The Navarro County Gen. Soc'y, 1989), p. 85. [S189] Navarro County Cemetery Records, vol. 9, above, p. 85 (giving the date but not the place). [S1223] Frank W. Johnson, A History of Texas and Texans, s.v. "John Burrow Haynie," above (giving the place but not the date). [S1223] Frank W. Johnson, A History of Texas and Texans, s.v. "John Burrow Haynie," above (first bullet). [S1424] Handbook of Texas, s.v. "Rice, Texas," online at https://tshaonline.org/handbook/online/articles/hlr14, viewed on 11 Mar 2018 (second bullet). Marriage*: She married Lewis B. Haynie, son of George W. Haynie and Sidney Linn. [S189] Navarro County Cemetery Records, vol. 9 (Corsicana, Tex. : The Navarro County Gen. Soc'y, 1989), p. 85 (not giving the date but stating that she was thirty-nine years and eight months old when she died on 27 Apr 1891). [S189] Navarro County Cemetery Records, vol. 9, above, p. 85. Ada Haynie Hervey's tombstone, Rice Cemetery, Rice, Tex. Other Names*: Ada Haynie, Libby Haynie, Ada Libby Haynie Hervey, Ada Libby Hervey, Ada Haynie Hervey, Ada Hervey. Mrs. Ada Hervey, wife of A. C. Hervey, banker at Rice, died at the family residence in Rice Friday morning [17 Jul 1931] at 6:40 o’clock following a stroke of paralysis Thursday morning and the funeral services will be held from the Haynie Memorial Methodist church in Rice Saturday afternoon at 4 o’clock with interment in the Rice cemetery. The services will be conducted by Rev. Bowman. Prior to her marriage, Mrs. Hervey was Miss Ada Haynie. She attended school in Corsicana and was a graduate of the Miller Select School for Girls in the class of 1900. She was prominent in the church and social circles of Rice and was well-known in Corsicana. Surviving are her husband, one daughter, Miss Margaret Hervey; one son, Claude Hervey, Jr., all of Rice; one brother, Tom Haynie, Tyler; and one sister, Ida Ham, West Texas. [S961] Find A Grave, online at http://www.findagrave.com, memorial for Ada Haynie Hervey, memorial no. 5048965, viewed on 12 Feb 2013. [S67] The Dallas Morning News, Dallas, Tex., 25 Jan 1902, p. 6. [S1207] Corsicana Daily Sun, Corsicana, Tex., online archive at http://corsicana.newspaperarchive.com, 17 Jul 1931, p. 10, col. 8 (obituary of Ada Libby Haynie Hervey) (not giving the date). [S67] The Dallas Morning News, Dallas, Tex., 18 Jul 1931, sec. II, p. 8 (obituary of Mrs. A. C. Hervey) (stating that she died at her home in Rice, Texas). [S1207] Corsicana Daily Sun, Corsicana, Tex., online archive, above, 17 Jul 1931, p. 10, col. 8 (obituary of Ada Libby Haynie Hervey) (stating that she died at the family residence in Rice, Texas at 6:40 a.m. "following a stroke of paralysis" the previous morning). [S961] Find A Grave, online, above, memorial for Ada Haynie Hervey, memorial no. 5048965, viewed on 12 Feb 2013 (giving the date but not the place). [S189] Navarro County Cemetery Records, vol. 9, above, p. 85 (common marker with Albert Claude Hervey) (giving the place but not the date). [S67] The Dallas Morning News, Dallas, Tex., 18 Jul 1931, sec. II, p. 8 (obituary of Mrs. A. C. Hervey). [S1207] Corsicana Daily Sun, Corsicana, Tex., online archive, above, 17 Jul 1931, p. 10, col. 8, reprinted here with consent of the Corsicana Daily Sun. [S67] The Dallas Morning News, Dallas, Tex., 18 Jul 1931, sec. II, p. 8 (obituary of Mrs. A. C. Hervey) (naming Mrs. A. C. Hervey as her mother). [S1207] Corsicana Daily Sun, Corsicana, Tex., online archive, above, 17 Jul 1931, p. 10, col. 8 (obituary of Ada Libby Haynie Hervey) (naming Ada Libby (Haynie) Hervey as her mother). Albert Claude Hervey's tombstone, Rice Cemetery, Rice, Tex. Obituary*: Saturday Rites Are Held For A. C. Hervey, Sr.
Funeral services were held from the Haynie Memorial Methodist Church in Rice Saturday at 2 p. m. for A. C. Hervey, Sr., 83, Rice banker who died in the Navarro Clinic Friday [22 Nov 1957]. Burial was in the Rice cemetery. Rev. Marvin Bledsoe and Rev. Jack Daniels conducted. Hervey was a native of Corsicana, and had resided here and in Rice all his life. He was vice president of the First State Bank at Rice, and had been an official of that institution for 50 years. Surviving are a son, Claude Hervey, Jr., Corsicana; a daughter, Mrs. H. A. Wilbur, Canadian, Texas; four grandchildren; a sister, Mrs. Pearl Rainwater, Austin; a brother, W. G. Hervey, Houston, and other relatives. Pallbearers were Barron South, Clarence Mahaley, J. K. Bradley, John Spencer, Joe B. Fortson and Ernest Cummins. 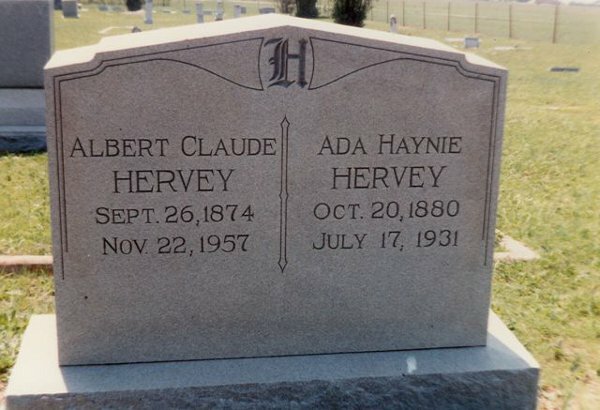 [S961] Find A Grave, online at http://www.findagrave.com, memorial for Albert Claude Hervey, memorial no. 5048964, viewed on 12 Feb 2013. [S961] Find A Grave, online, above, memorial for Albert Claude Hervey, memorial no. 5048964, viewed on 12 Feb 2013 (giving the date but not the place). [S1207] Corsicana Daily Sun, Corsicana, Tex., online archive, above, 23 Nov 1957, p. 12, col. 2 (obituary of A. C. Hervey, Sr.). [S189] Navarro County Cemetery Records, vol. 9, above, p. 85 (common marker with Ada Haynie Hervey) (giving the place but not the date). [S67] The Dallas Morning News, Dallas, Tex., 23 Nov 1957, pt. 4, p. 3 (obituary of A. C. Hervey Sr.). [S1207] Corsicana Daily Sun, Corsicana, Tex., online archive, above, 23 Nov 1957, p. 12, col. 2, reprinted here with consent of the Corsicana Daily Sun. [S1207] Corsicana Daily Sun, Corsicana, Tex., online archive at http://corsicana.newspaperarchive.com, 17 Jul 1931, p. 10, col. 8 (obituary of Ada Libby Haynie Hervey) (naming Ada Libby (Haynie) Hervey as her mother). [S1017] Navarro County, Texas Genealogical and Historical Web Site, online at http://www.rootsweb.ancestry.com/~txnavarr/index.htm (reprinting obituary of Margaret Wilbur from Corsicana [Tex.] Daily Sun, 7 Jul 1986) (not giving the date but stating that she was seventy-seven years old when she died on 5 Jul 1986). [S1017] Navarro County, Texas Genealogical and Historical Web Site, online, above (reprinting obituary of Margaret Wilbur from Corsicana [Tex.] Daily Sun, 7 Jul 1986).